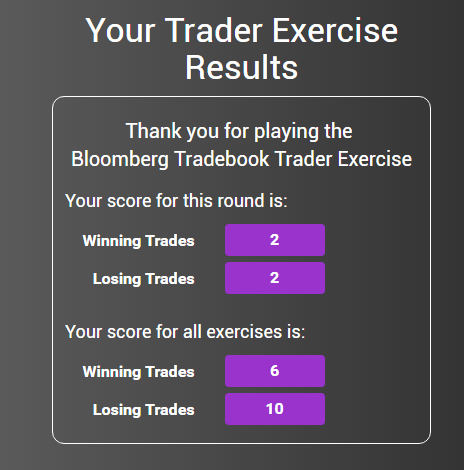 The Bloomberg Tradebook Trader Exercise has been designed by The ReThink Group to assist traders in practicing the thinking style. This mind game can be accessed over the web and bloomberg terminal. Ironically, brain and behavioral research shows that the markets only masquerade as a numbers game. They are actually a game that neuroeconomists have called “intentional social risk”. As such, this trader brain warm-up leverages classic psychology research into the perception of social meaning. If indeed the brain works a bit like muscle, engaging with the exercise can be expected to help bring a trader into the right mindset to make his or her best trades. This game is based on Classic Heider-Simmel Experiment (1944) – Using only geometric shapes, they determined that almost 100 percent of subjects watching such shapes move impute human meaning and a story to the movements. Even when their shape video played in reverse, all but two of the studies’ subjects reported a detailed story being played out. A series of video is played out with moving shapes followed by questions to predict a particular shapes next move.